Directing is a management function through which the management instructs, guides, and inspires the employees by communicating with them. It also oversees the performance of the employees for the achievement of the predetermined goals. It is the function of leading the employees to perform efficiently, and contribute to their optimum for the achievement of the organizational objectives. Directing is a very important management function for every organization. Directing is an important link with the other management functions. The functions of planning and organizing lose their importance if the function of directing is missing in the chain of management functions. While the functions of planning and organizing prepare a base for action, the function of directing initiates the action in the organization. The process of directing in the organization is not limited to initial set of instructions but is a process which takes place on a continuous basis after it has started. Further, this process takes place at all the levels of the management. Directing functions follows the hierarchy of the organization which means that it begins at the top management level and then travels downwards in the management hierarchy. Directing consists of the process and techniques of issuing instructions for making certain that operation are carried out as planned. It is telling the employees what to do and seeing to it that they do to the best of their ability. The management experts have defined this function in many ways. Some of the definitions are given below. “Activating deals with the steps a manager takes to get sub-ordinates and others to carry out plans”. – Newman and Warren. “Directing is the inter personnel aspect of managing by which subordinates are led to understand and contribute effectively and efficiently to the attainment of enterprise objectives.” – Koontz and O’Donnell. As a function of management, directing is useful to the organization in many ways as given below. It guides and helps the subordinates to complete the given task properly and as per schedule. It provides the necessary motivation to subordinates to complete the work satisfactorily and strive to do their best. It helps in maintaining discipline and rewarding those who do well. Directing involves supervision, which is essential to make sure that work is performed according to the orders and instructions. Different people perform different activities in the organization. All the activities are interrelated. In order to co-ordinate the activities carried out in different parts and to ensure that they are performed well, directing is important. It helps to integrate the various activities and also helps in integrating the individual goals with organisational goals. Directing involves leadership that essentially helps in creating appropriate work environment and in the building up of team spirit. The function of directing has got the following characteristics. Pervasive function – Directing is required at all levels of the organization and implies issuing orders and instructions. Besides issuing orders and instructions, every manager provides guidance and inspiration to his subordinates. He counsels his subordinates to do his job properly. Continuous activity – Directing is a continuous activity. It continues throughout the life of the organization. Human factor – Directing function is related to subordinates and therefore it involves human factor. Since human factor is complex and behaviour of the subordinates can be unpredictable, the function of directing becomes an important function. Creative activity – The function of directing helps in converting plans into performance. Without this function, employees become inactive and physical resources are meaningless. Executive function – The function of directing is carried out by all managers and executives at all levels. It is the function that runs from top to down in the organizational structure. Throughout the working of the organization, a subordinate receives instructions from his superiors for doing his job. Delicate function – The function of directing is a delicate function since it involves dealing with human beings. Human behaviour is unpredictable by nature and conditioning the employee’s behaviour towards the goals of the enterprise is what the manager does in this function. Directing is a complex function as it deals with employees whose behaviour is unpredictable. Effective directing is an art which a manager can learn and perfect through practice. 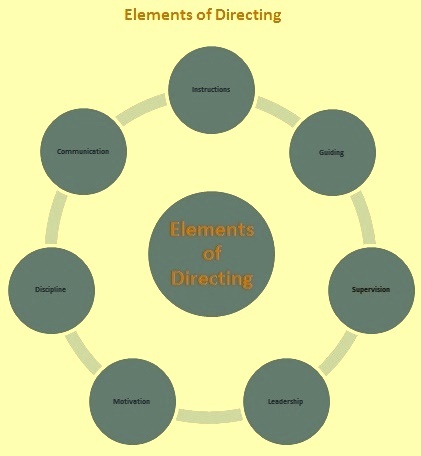 Directing has the following principles which make the directing function effective in the organization. Principle of leadership – It is the ability to lead effectively and is essential for the effective directing of the subordinates. Principle of communication – A good system of communication between the superior and his subordinates helps to improve mutual understanding. Upwards communication helps a manager to understand the subordinates to express their feeling. Through this principle the management recognises the importance of an informal organization. Principle of direct supervision – Directing becomes more effective when there is a direct personal contact between the superior and his subordinates. Such contact improves the morale and commitment of the employees. Therefore, whenever possible direct supervision is to be used. Hence the manager is to supplement objective methods of supervision and control with direct personal supervision to ensure personal contact. Principle of direct objectives – The manager is to communicate effectively and motivate the subordinates for most effective performance for the achievement of the objectives. Principles of harmony of objectives – Employees join the organization to satisfy their physiological and psychological needs. They are expected to work for the achievement of organizational objectives. They will perform their tasks better if they feel that it will satisfy their personal goals. Therefore, the manager is to guide the subordinates so that their individual interest harmonizes with the organizational interests. Principle of unity of command – A subordinate is to get orders and instruction only from one superior. If he is made accountable to two superiors simultaneously, there will be confusion, conflict, disorder and indiscipline in the organization. Therefore, every subordinate should be asked to report to only one manager. Principle of managerial communication – A good system of communication between the superior and his subordinates helps to improve mutual understanding. Upwards communication helps a manager to understand the subordinates to express their feeling. The manager being the principle medium of communication, should keep lines of communication open. Principle of comprehension – The communication should ensure that the recipients of the information actually comprehend it. Principle of direct communication – The direct flow of information is most effective for communications. Principle of appropriate techniques – The manager is to use correct direction techniques to ensure efficiency of directing. The techniques used are to be suitable to the superior, the subordinates and the situation. Directing function has certain elements. The important elements of directing are given below and shown in Fig 1. Issuing of orders and instructions – The first element of directing function is the issuing of orders and instructions by the superiors to the subordinates for getting the work done in the desired manner. The orders are to be as few as possible. More orders than those that are absolutely necessary result into the loss of independence and thus suppression of the initiatives of the subordinates. The orders are to be clear and brief but complete and convey fully what is intended to be done. Such orders create confidence in the mind of the subordinates. Further the subordinate is to have the clear understanding of the order given. Guiding the subordinates – Another important element of directing function is the guiding of the subordinates. The subordinates are to be guided to the proper method of work. The proper guidance orients the employee towards the organization. This orientation is necessary for them to accomplish the objectives of the organization. Supervision – In order to see that the work is done according to the instructions, the superior must observe the activities of the subordinates. Supervision is an important component of the function of directing. It is done to ensure that the performance of the subordinates conforms to the plans and contributes to the attainment of the organizational goals. Supervision is done at all the levels of the management. However, supervision is more important at lower levels. Leadership – Leadership is the ability to persuade and motivate others to work in a desired way for achieving the goal. Thus, a person who is able to influence others and make them follow his instructions is called a leader. Leadership is the process, which influences the people and inspires them to willingly accomplish the organizational objectives. The main purpose of managerial leadership is to get willing cooperation of the employees in pursuit of the goals. Appropriate and inspiring leadership alone can influence the subordinates to better their performances. Motivation – Motivation is one of the important elements of directing. Motivation of the employees is one of the most challenging problems for the management. It has to induce the employees to utilize their talent and skill to contribute to the organizational goal. It creates in men, the willingness to work whole-heartedly for attaining objectives. Issuance of proper instructions or orders does not necessarily ensure that they will be properly carried out. It requires manager to inspire or induce the employees to act and get the expected result. It is the force that inspire a person at work to intensify his willingness to use the best of his capability for achievement of specify objectives. It may be in the form of incentives like financial (such as bonus, commission etc.) or, non-financial (such as appreciation, growth etc. ), or it could be positive or negative. Basically, motivation is directed towards goals and prompt people to act. Maintenance of discipline – Discipline is an important element of directing function. Proper discipline is required to be maintained in the organization for the orderly behaviour of the employees. Communication – Communication is the core of direction. It is through the communication net-work that a manager instructs his subordinates as to what they should do and how they should do it. Communication refers to the process by which a person (known as sender) transmits information or messages to another person (known as receiver). Proper communication results in clarity and securing the cooperation of subordinates. Faulty communication creates problems due to misunderstanding between the superior and subordinates. The subordinates must correctly understand the message conveyed to them. Communication does not always flow from manager to subordinate. It can also be from a subordinate to the manager. It is a two way process.